Today was Mr. Ben's first day of preschool. Since we are homeschooling Faith this year, I moved him to the preschool program that she went to that I absolutely love. It's from 1-3:30pm, so perfect for him and I only need to send snacks, not a whole lunch. Of course, the boy does like to eat, and our version of snack may be a little larger than average. 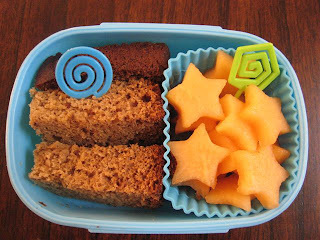 Today, he took homemade cherry banana bread (see below for the recipe) and cantaloupe stars. It was all gone and he told me it was yummy. You can use plain yogurt or flavored. I use flavored in complementary fruits (cherry, blueberry, strawberry, etc) and sometimes throw in a cup or so of dried or chopped fruit with it. If you use a flavored, sweetened yogurt, you can cut back 1/4 cup of sugar without a noticeable flavor difference. If you use plain yogurt, I'd leave the full amount of sugar. That looks so delicious. I have other snack ideas at http://www.snacksnoop.com though I doubt you will need them. I was just wondering how big of a bento box you are packing for preschool snacks. I have a 5 year old in kindergarden who needs snacks and I'm working with 250 Ml containers. It's always hard to know how much food to send, though I was pretty happy about how healthy and tasty our food was compared to the other kids' snacks. @ Silver Sisters: My first grader eats the cafe lunch but they have a snack time in the later afternoon. I pack her a small 'sidear' bento and use three mini silicone baking cups that I have cut down in height. I think it's best to figure how much time they have to eat and how much your child likes to eat and how fast or slow they eat. Mine likes a lot of food, but eats slowly. I usually give her something like 3 grape tomatoes, a strawberry and a few goldfish and rasins. I try to mix the color and texture.